This is the new Reality Drop. No games, just truths. If you ignore a lot of suspicious and unreliable data, it's clear that global sea levels have remained stable. Whether you look at tide gauges or satellite data, sea levels are going up. Sea level rise is measured both by tide gauges from around the world and by satellite. These independent data sets tell a consistent story: that global sea levels are rising, despite slight variations up and down each year. The evidence is clear that sea levels will continue to rise as the world gets warmer because of man-made pollution. Here's an example: Global mean sea level did slightly decline during 2010. But a true skeptic should ask what has caused this short-term decline, especially since it appears counterintuitive. After all, land-based ice continues to melt rapidly and the oceans continue to warm rapidly (thermal expansion of ocean water contributes to sea level rise). So what has dampened the long-term sea level rise illustrated in Figure 1? As Skeptical Science has previously reported, climate scientists attribute the short-term decline to extreme flooding in 2010. This period also saw a strong La Niña cycle, which typically results in an increase of rain and snow falling over land, which corresponds to a fall in global sea level. (Remember that most water that falls as rain or snow started as ocean water.) 2010 and 2011 saw some epic deluges throughout the world; countries such as Pakistan, Sri Lanka, Australia, the Philippines, Brazil, Colombia, and the United States were hammered with extreme flooding. Figure 1 illustrates where the water has gone. 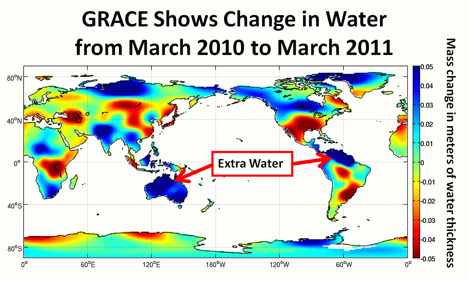 Figure 1: Change in land-based global water storage in the period March 2010 to March 2011, as observed by GRACE gravity satellites. Source: NASA JPL. In short, arguments that sea level rise has stopped are based on the same tired old "skeptic" tricks of cherry-picking short-term data and ignoring the long-term trend. We know that ocean warming and melting ice will cause sea level to rise over the long term, and the only reason the sea level rise temporarily slowed in 2010 is that there was so much flooding on land — hardly a result worth celebrating. As long as humans continue to warm the planet by increasing the amount of greenhouse gases in the atmosphere, we can expect the long-term sea level rise to continue. Copyright 2015 The Climate Reality Project. All rights reserved.